What would the ghosts of 1918 -- not just the soldiers who were slaughtered in the trenches of World War I, but the statesmen who failed to make a durable peace afterward -- tell politicians a century later about the perilous world we inhabit today? Against this backdrop, let’s look at the midterm elections. The results are a mixed bag, to be sure, but my sense is that America took a collective step back from the brink on Tuesday. The election was largely about Trump’s leadership, and balloting for the House of Representatives -- the broadest measure we have of what the country thinks -- tells us that the nation wants a change from Trump‘s style of governing. This election was a character test for America, notes Rick Atkinson, whose “Liberation Trilogy” painted an unforgettable portrait of US leadership in World War II in Europe. “You find yourself hoping for a savior -- someone who will arise and become a statesman. But that’s a fool’s errand. Politics is a collective act, just as war is a collective act.” The only safeguard against catastrophic leadership is sound public judgment. Democracy, in theory, is a self-correcting system. If voters think the country is veering in the wrong direction, they can do something about it -- by electing new leaders and changing course. That seems to be happening. Even with Republican victories in some key Senate and gubernatorial races, the electorate‘s unhappiness with Trump seems clear, as it does consistently in opinion polls. 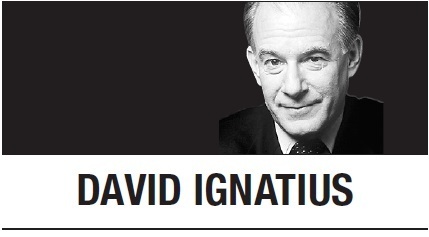 David IgnatiusDavid Ignatius’ email address is davidignatius@washpost.com. -- Ed.